The artist L S Lowry (1887-1976) was most famous for painting scenes of life in the industrial districts of the north of England in the mid-20th Century. 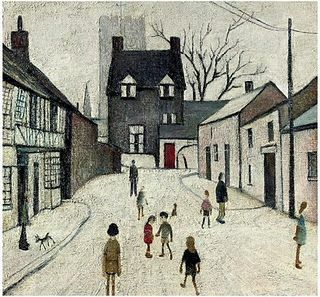 But in the bitter winter of 1947, Lowry paid a visit to the Cotswolds and celebrated the local area by depicting winter street views of Moreton-in-Marsh, Bourton-on-the-Water, Stow-on-the-Wold and Northleach. One of Lowry's oil paintings, entitled Street in Northleach, which showed children in his trademark matchstick figures playing in the snow, was sold in 2010 to an unnamed buyer for £265,250. The following year, Lowry's painting of The Market Square in Stow, sold at Christie's for £481,250 to an unknown bidder. 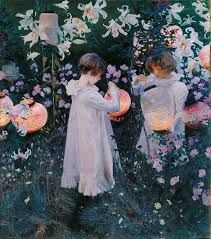 The leading American portrait painter of the Edwardian period John Singer Sargent (1856-1925) painted his most famous painting Carnation, Lily, Lily, Rose in 1895 while he was living in the beautiful Cotswold village of Broadway. During this time, Broadway had been discovered and ‘colonised’ by various wealthy artistic Americans and it became an immensely inspiring time for Sargent. It was whilst Sargent was staying with Francis D Millet at Farnham House on Broadway’s village green that he embarked upon his most celebrated painting, the title of which came from the light-hearted lyrics of a popular song. Once completed, Sargent's painting was very quickly acquired for the nation by The Tate gallery, where it has been celebrated and revered ever since. 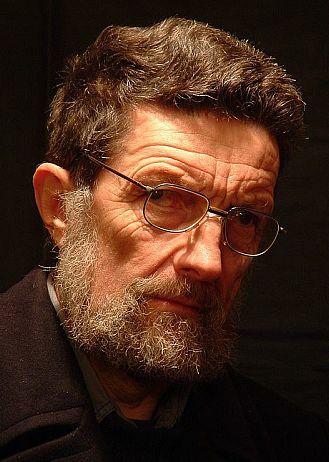 The Cotswolds has more than one close connection with Kit Williams, the artist, illustrator and author best known for his 1979 book Masquerade which for a time captured the imagination of the nation. Masquerade was a pictorial storybook containing clues to the location of a golden jewelled hare created by Williams and then buried "somewhere in Britain". In 1985, Williams designed the much-loved Wishing Fish Clock, a centrepiece of the Regent Arcade shopping centre in Cheltenham. The clock is over 45 feet tall and features a duck that lays a never-ending stream of golden eggs and includes a family of mice that are continually trying to evade a snake sitting on top of the clock. Hanging from the base of the clock is a large wooden fish that blows bubbles every half-hour. Catching one of these bubbles entitles you to make a wish, hence the name of the clock. Williams was also involved in the design of the Dragonfly Maze in Bourton-on-the-Water, which comprises a yew maze with a pavilion at the centre. The object is not only to reach the pavilion, but to gather 14 clues as you navigate the maze. The clues enable you to finish the maze by finding the hidden Golden Dragonfly. Damien Hirst, who is reportedly Britain's richest living artist, has a number of Cotswold connections. Hirst has several studios in the Stroud area, and in 2005 he bought Toddington Manor, a 19th Century country house in the north Cotswold village a few miles from Winchcombe. He has said he plans to restore the manor and use it as a family home and a gallery.